Enter each element of the data set (or paste a copied data set) into this text box. Be sure each number is separated by a space, a comma, a line return, or any combination of the three. Also, if you wish to enter a frequency for each number, enter the number, followed by a lowercase x, followed by the multiplier (for 3 number twos, enter 2x3). This is the total number of elements detected in the data set field. This is the sum of elements detected by the Standard Deviation Calculator. This is the average or mean of the items within the data set. This is calculated by summing the items within the set, and then dividing the sum by the number of items. This is the variance of the data set (also called the Mean of Squared Differences) if the items entered represent the entire (population) data set. This is the population standard deviation, which is calculated by finding the square root of the population variance. This is the variance of the data set (also called the Mean of Squared Differences) if the items entered represent only a portion (sample) of the data. This is the sample standard deviation, which is calculated by finding the square root of the sample variance. 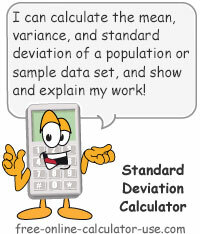 This calculator will calculate the variance and standard deviation for either a population or a sample data set. You can either enter the numbers in the data set one at a time, or you can copy and paste an existing data set (if separated by spaces, commas, line returns, or any combination thereof), or you can enter a number and its frequency (12x4, 8x6, 9x4). Plus, unlike other online statistics calculators, this calculator will generate and display the step-by-step process used to calculate the results. Enter or paste numbers in data set (separated by comma, space, or return) into the top field of the calculator. Tap the "Calculate Standard Deviation" button and scroll down to view the results. In addition to displaying all of the stats based on the data set, the results will also include the step by step process the calculator used to generate the results. What variance and standard deviation are and how to calculate them. In my opinion, if the "powers that be" really wanted to entice kids into embracing mathematics, they would use kittens, puppies, bunny rabbits, etc., as math symbols, not Greek (geek) letters. That's the scary-looking formula for calculating the variance (σ2) and standard deviation (σ) of a population data set. But wait! Keep your candles burning! As you will see in the example further down the page, the steps to calculating variance and standard deviation are much easier than trying to decipher the Greek/geek formula. Standard Deviation is simply one of several methods for summarizing the dispersion of the values in a set of data. Specifically, standard deviation is the square root of the variance, which attempts to summarize the variability or dispersion of values relative to the mean of the entire set. A small standard deviation indicates the values are tightly grouped around the mean (average) of the data set. A large standard deviation indicates the values are not tightly grouped around the mean (average) of the data set. Population: The data set is the total set of elements of interest for a given problem. Population parameters in the formulas on this page are denoted by σ and μ. Sample: The data set represents only a fraction of the population as defined above. Sample parameters in the formulas on this page are denoted by s and X. Find the mean of the data set. Find the sum of the squared differences from the mean. Divide the result in step #2 by n (population) or n - 1 (sample), where n is the number of items in the set. Find the square root of the result in step #3. To see just how easy the above steps are, let me walk you through an example. Note: Decimals in this example are rounded to 2 places before they are displayed on the screen. The mean is the average of all numbers in a data set. To calculate the mean of set of numbers, you add all of the items together and then divide that result by the number of items within the set. Step #2: Find the sum of the squared distances from the mean. Step #3: Calculate the variance. Step #4: Calculate the square root of the variance.